This simple summer salad is spectacular! It’s light but filling, and it’s very easy to make. This salad would make a great starter for a summer BBQ, but a larger portion makes a healthy meal in itself. 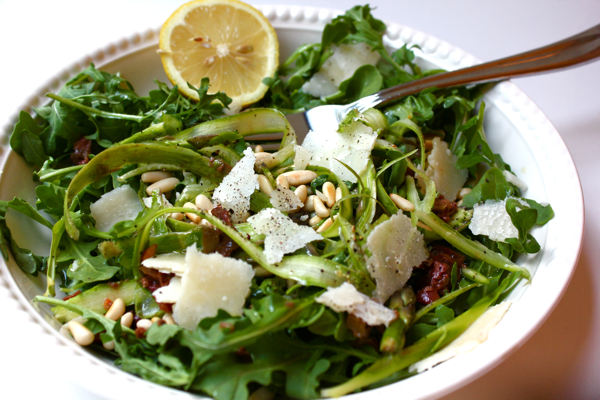 To make it, pile some fresh arugula into a bowl. Top it with shaved asparagus. To shave asparagus, place a spear of asparagus on a cutting board, and run a vegetable peeler over it. Use your vegetable peeler to shave some pieces of parmesan cheese, and sprinkle those on the salad as well. Next come a few chunks of olives, mine were from an olive tapenade, and some toasted pine nuts. BUT NOT TOO MANY! For the dressing, squeeze over some lemon juice and drizzle on some olive oil. Freshly cracked pepper and a little bit of salt finish things up nicely. And now dig into this balanced salad! It has all the flavors I desire. Well, except sweet, but sweet doesn’t fit in here anyway.